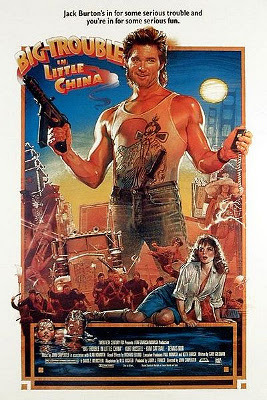 So I watched Big Trouble in Little China for the first time in decades the other night. Why don't people make great movies like this anymore? The whole ‘adventure’ in the movie reminds me of the way my old group used to play Call of Cthulhu back in high-school: essentially as modern day ‘D&D’ with lots of bad decisions. The film includes a D&D "beholder" (or at least a creature clearly inspired by a D&D "beholder"). That was a fun surprise. Classic Fantasy – a supplement for RuneQuest 6 (soon-to-be Mythras) is now available for purchase from the Design Mechanism. We are delighted to announce that Classic Fantasy is now available to pre-order in print, or buy for immediate download in PDF. 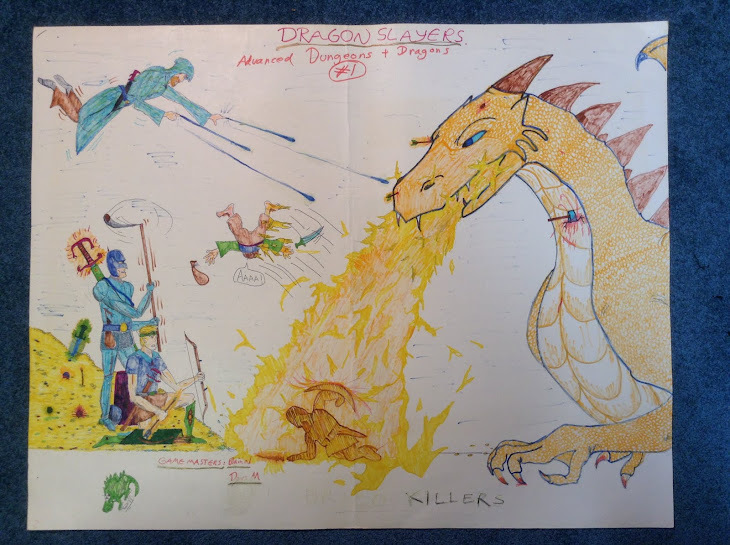 Classic Fantasy brings Old School dungeon crawls to the Mythras and RuneQuest 6 rules. This 336 page book contains everything you need to emulate the fun of class and level-based adventuring, against the classic coterie of monsters, with the classic armoury of spells! If you've ever wanted to convert those old dungeon modules to a d100 system, then Classic Fantasy is for you. Packed with information and new rules additions, Classic Fantasy features a different approach to character creation based on classes such as the bard, cavalier, fighter, magic user, paladin and thief. Choose your race - human or demi-human - and then customize according to class, race and personal preference. If you're a magic user or cleric, the new magic rules for Arcane and Divine spells take the old staples such as Magic Missile, Charm, Fireball and more, and tailor them for the nuances of the Mythras and RQ6 systems. Or, for the more combat-oriented, the Classic Fantasy rules provide detailed miniatures-based combat adaptations for the traditional battle-board, complete with guidance on facings, positioning, and handling detailed movement. And of course, no book like this would be complete without monsters to kill and treasure to take! All the old favourites are accounted for, from Basilisks to Displacer Beasts, Grey Ooze to Gelatinous Masses, Kobolds, Gnolls, Hobgoblins and more. Forty pages of treasure and magic items helps you equip even the deepest dungeon with enough loot to satisfy the keenest adventuring party. You can buy Classic Fantasy in these ways...Preorder the Print Copy: $44.95, available in 6-8 weeks (shipping approx 1st June 2016) and get the PDF free of charge, with immediate download. Simply visit our online store (www.thedesignmechanism.com/products), and select Classic Fantasy from the Supplements catalogue. This is not a standalone game. 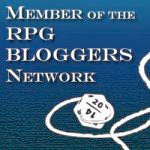 Games Masters and players will need access to either the Mythras or RQ6 rules to play Classic Fantasy (although other d100 rule systems may suffice). So break out the Mountain Dew and the Cheetos... Classic Fantasy is here! Although the announcement does not mention ‘Dungeons and Dragons,’ emulating that style of adventuring with the RQ6/Mythras rules is obviously the aim of this supplement. I remain a fan of what can be called the ‘D&D genre’ of FRPGs, and I obviously am a big fan of RQ6/Mythras, so I’ll definitely be getting Classic Fantasy (even though I likely will continue to rely primarily on a heavily house-ruled version of AD&D, or an ‘old-school-ized’ version of 5e D&D, for most of my future D&D-style games). 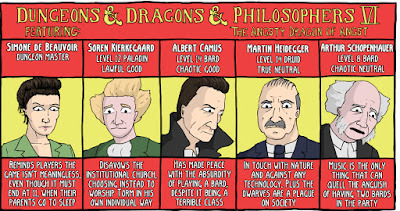 Another great "Dungeons and Dragons and Philosophers" episode from Existential Comics! Camus's The Myth of Sisyphus was the first work of philosophy that I read carefully from beginning to end (I did so for a first-year university course on existentialism). So I retain a certain fondness for Camus, even though my professional work has nothing to do with existentialism. 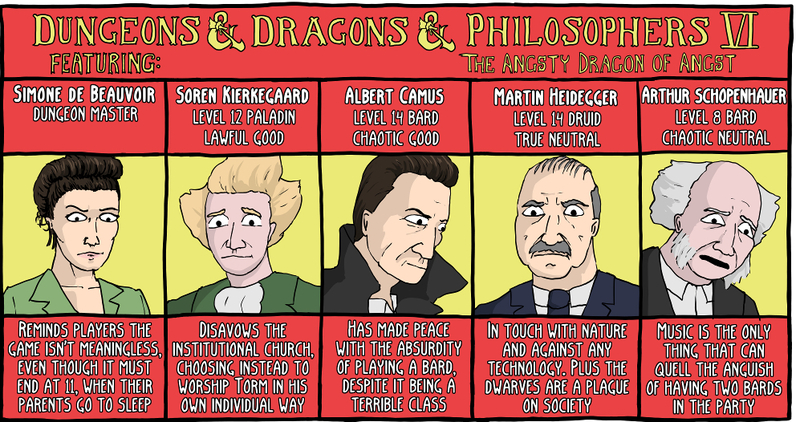 And of course I still play Dungeons & Dragons. And I like bards! Indeed, they're my second-favourite class (after mages).